America’s favorite No. 1 engine is chugging into Roaring Camp alongside his pal Percy for a special event: Thomas and Percy’s Halloween Party. Junior engineers are invited to wear their Halloween costumes and bring the entire family for a fun-filled day at Thomas and Percy-themed activities. Entertainment includes Thomas & Friends storytelling, magician, juggler, bounce houses, an Imagination Station with face painting, temporary tattoos, and more! 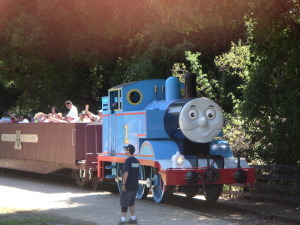 The roundtrip Thomas The Tank Engine and Percy train excursion travels along the scenic San Lorenzo Valley River Gorge and Henry Cowell Redwoods State Park. Trains depart from 10:30 a.m. to 2:30 p.m. daily. Tickets: $24 for guests ages 2 and up. Thomas and Percy’s Halloween Party is expected to sell out so advance ticket purchase is recommended. Log on to www.roaringcamp.com or call TicketWeb at 1-866-468-7630 or. For information and directions, contact Roaring Camp at 831-335-4484. Roaring Camp is in Felton, six miles north of Santa Cruz. Exit State Route 17 at Mt. Hermon Road. Continue toward Felton to Graham Hill Road, then left ½ mile to Roaring Camp. Parking is $8. This entry was posted in Haunted Attractions, Home Page, Home Page Slider, News and tagged Roaring Camp Railroads, Thomas and Percy's Halloween Party. Bookmark the permalink.